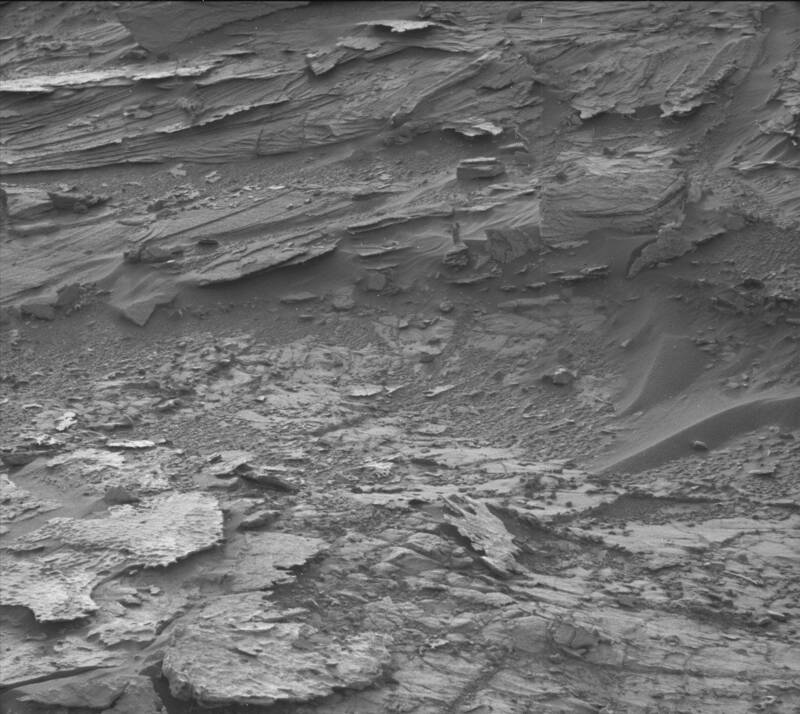 How delightful, for an angel to turn up in the frame of a photograph taken from the Curiosity Rover on the surface of Mars. The photograph may be found at the NASA website (here): gentle reader should not take long to spot the being in question, a little north-east of the centre. While I’ve never been a confident angel sexer (or “genderer” to those of you politically inclined), it is evident from enlargements that this one is female, with breasts and long hair, which I would guess to be red in colour. She is standing on a small rock and, calculating from the scale of the picture, she is just shy of four inches high. True, other observers have identified her as Lady Liberty, or the goddess Venus, or a Martian Girl Guide on watch, and the British tabloids call attention to the low cut of her gown. Others think she is an ancient statue. One might imagine a parasol in her right hand, a shield in her left, but look closer. These are all fanciful suggestions. The figure is that of a small angel. Well, yes, it is a low-cut gown, but more in the Jane Austen fashion than that of a TV babe at the present day. Perfectly chaste to a mind that is chastened. Strong wings are visible behind this figure (the camera has captured the solar glint on the topfolds of these wings), and I would say the “parasol” is actually a flaming sword. She is, after all, a Martian angel, not an Earthling angel, charged to defend the honour of that planet, and not ours. Notwithstanding, an angel is an angel, and the family resemblance between theirs and ours is plain enough. I was rather expecting Curiosity Rover to find such figures, in its rambles about Gale Crater. In the absence of visual distraction to creatures biologically engendered and endowed, they would naturally stand out better in photographs. On Earth, they tend to be obscured by stronger colour and shading contrasts on the palpable objects; they pale within our denser atmosphere. Paradoxically, they are easier to pick out in our moonlight, especially when the Moon is full. The bodies of the angels are simulacra — they are without extension, as Aquinas has explained — yet as we know from innumerable other sources, they can be manifest in space and time. Sometimes they appear as heralds, to one event or another; but the human mind is not well-attuned to angelic motion or message. We are capable of mistaking them for elves or pixies, for fairies or leprechauns of some sort; and vice versa, leprechauns for angels. I am content simply to observe.